Mechanical Detachable Gooseneck Lowbed - Kingpin Trailers LTD. The three position stirrups (on mechanical goose-necks only) can easily accommodate a variety of desired 5th wheel heights and deck heights. The multi-position gooseneck door adjustment allows for a full range of king pin height settings. The notched control bar for the handle takes the guesswork out of setting the gooseneck doors in the desired position. The front approach ramps. featuring heavy duty 3/4″ full-width traction aids, have been extended forward to lower the front edge of the ramp to only 4′. Ramp pullouts can be added by simply removing the aluminum side panels. 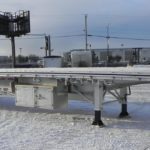 The hydraulic gooseneck (optional) delivers over 34″ vertical range of motion for the deck, from 9 3/4″ below grade to over 24 1/2″ ground clearance, to accommodate a variety of less-than-perfect loading, hauling, and unloading circumstances. Removable roller pin makes roller maintenance and replacement easier. Optional retractable gooseneck pins makes the switch to a flip neck possible without removing rollers. Access panel is removable for easy maintenance of hydraulic, air and electrical lines. Deeper mini-boom trough provides clearance for equipment with hitches. In addition to pro-viding a convenient step for the operator. the removable plates provide easy access to axles. Traction aids and D-rings in transition area are standard. The mechanical gooseneck comes with a storage area and chain rack. The back wall of the storage area also serves to cover the front center section of the gooseneck. Available options include a removable aluminum door (inset) and two storage area lights with switch. The V-shaped guide directs the gooseneck into position during hook-up, making it a quick, easy one-person operation. A horizontal safety pin locks the main pin in place so it cannot accidentally disconnect. The main frame features steel crossmembers on 12″ centers: 8″ full-width alternating with 4″ stub crossmembers in the outer bays. (Also available: aluminum I-beam or bar beam cross members.) Removable decking fn front 61 of center bay reveals storage area for outriggers, etc. The air control pane; is housed in an aluminum control box conveniently located between the axles on the driver’s side of the trailer. No more having to climb up on the trailer or reach over a flip axle to get to the controls. Quick coupler air lines on the MG (hydraulic lines on HG) are attached to adaptors on the bulkhead of We deck. Electrical line features a replaceable jumper cable between the neck and the deck. Replacing damaged lines is easy and convenient. The MG-HG includes thirteen pair of various kinds of D-rings (straight, bent-style, recessed. and pan-style), top flange keyhole slots for I/2″ chains on 24″ centers, and swing-out brackets on 24″ centers for mounting (optional) full-depth outriggers. 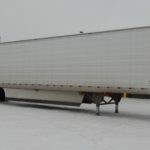 Various “aluminum packages” are available for the gooseneck (full width only), main deck, and wheel area, including such things as aluminum I-beam or box beam cross members, outer rails, decking, and front and rear channels. Gooseneck flip extensions allow for more precise weight distribution to the truck axles, greater swing clearance, and shorter trailer length for back haul. Aluminum pull-outs include full-width aluminum box beam cross members on 16′ centers. The pull-outs, when fully extended, provide an overall trailer width of 13 feet. Configure your MG-HG to suit your particular hauling needs, with the addition of a flip axle or third fixed axle.